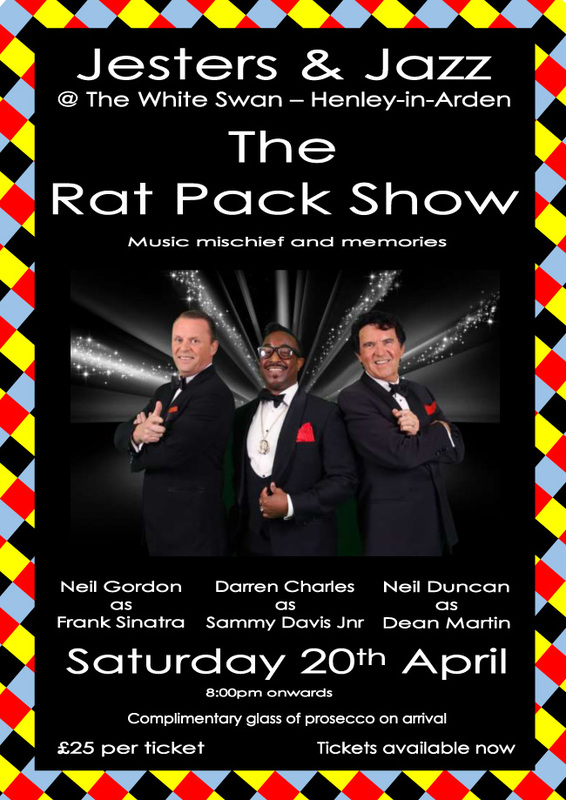 Ticket sales at Dukes close on Thursday 18th April, then contact Sally Harfield 01564 795909 or pay on the door. The Rural Cinema would appreciate help with setting out the chairs and putting them away. “Henley Together” – How did they do? 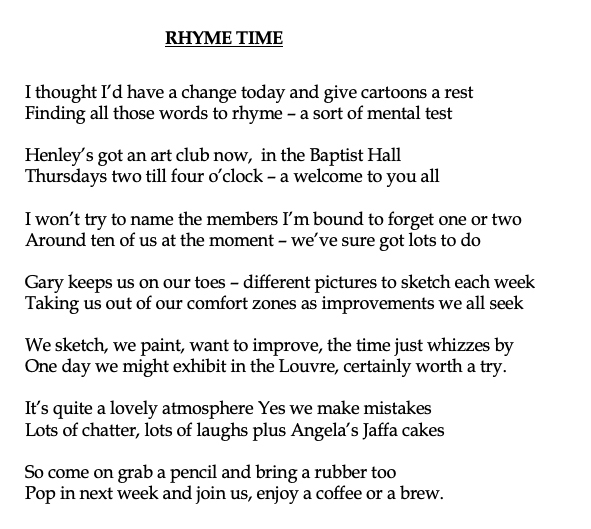 Four years ago a group of residents got together under the “Henley Together” banner to try to improve the way the Joint Parish Council was being run. They promised to reduce administration costs and make the Council more inclusive and its dealings more transparent. The group put up twelve candidates and, remarkably, they were all elected! 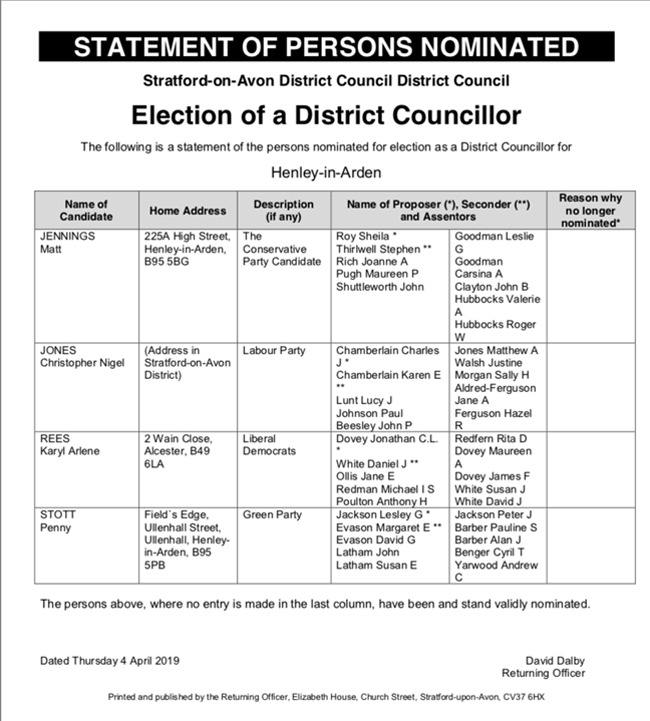 As their term in office comes to and end and we approach elections for a new Council, it’s a good time to ask – did they deliver on their manifesto? First, and easiest to identify, did they reduce administration costs? Well, in the four years of the previous Council a total of £173 600 was spent on administration and, on a like for like basis, the “Henley Together” Council spent £143,004 during its four years. So, despite inflation and increases in the Clerk’s salary and pension rates, the current Council has spent £30,596 less on administration than its predecessors. On the issue of inclusiveness - I know from personal experience that, from the point of view of public participation, the previous JPC meetings were run rather like a strict schoolroom with members of the public wanting to make a contribution limited to three minutes per speaker and subject to a barrage of rules and constraints. During the public participation part of the meeting, dialogue with Councillors was discouraged. Under the current JPC members of the public have been encouraged to speak and allowed enough time to get their point across and where appropriate receive an answer from Councillors there and then. Members of the public with relevant information have also been allowed to contribute during the main meeting. Minutes of the meetings show the extent and value of this increased opportunity for public input to the Council. With regard to transparency, in addition to very detailed meeting minutes the JPC web site itemises every JPC receipt and payment for the year to date. In fairness, the previous Council also produced thorough minutes and the financial transactions were also shown, albeit monthly. Where there is the biggest difference perhaps is in the amount of business conducted in private session – a regular occurrence with the previous Council but hardly ever taking place with the current Council. So far so good but has it all been plain sailing? Well the Council spent £3,000 in a failed attempt to get permission to suspend the Christmas lights across the High Street and controversially increased the precept by £30 000 to ensure the continued survival of the Town Library and the HUB Youth Club and Community Centre after the withdrawal of support from WCC. This funding more or less fully supports the Library and meets 50% of the HUB’s costs. This works out at an average of 31p a week per household. This doesn’t seem much for the benefit gained - but not all residents agree. A big plus for the current Council is that they have bitten the bullet and actually started the process of taking ownership, and therefore control, of Henley’s car parks and avoided the imminent sale to a third party. 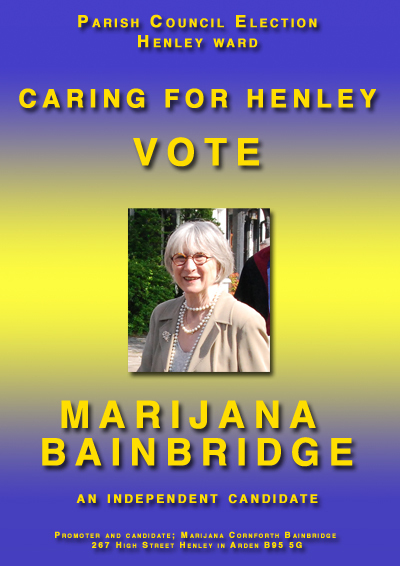 To sum up then – “Henley Together” delivered, by and large, on its manifesto commitments and has done a good job for Henley. 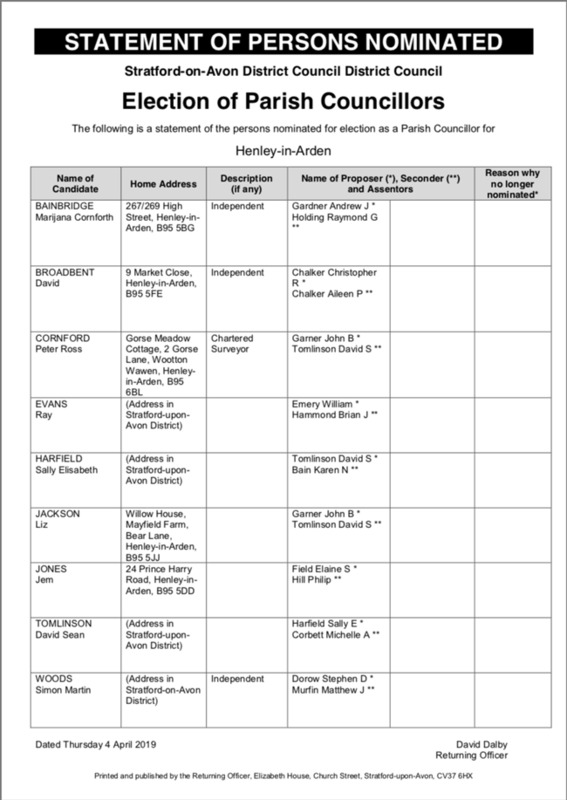 With only three of the original “Henley Together” Councillors standing again we must hope that the good work is continued by the incoming JPC. The Council increased taxes for 2018/19 Financial Year by 2% general tax and 2% special levy for adult social care. The general tax rise was the highest allowed by Government before a requirement to hold a referendum and the 2% special levy was part of a programme by Government to allow Councils to raise 6% in total over three years. So far the Council has raised 4% in levy. The total social care budget, including children’s social care, adult social care and public health accounts for 63% of the council’s controllable budget. Highways accounts for 9% of the budget. A recent survey of residents nationally identified Warwickshire as top for highway maintenance. Public Health activity during the year has been focused on prevention of obesity and stopping smoking. During the summer holidays the County provided additional meals for children in receipt of free meals at school. I expect the same service will be provided in 2019. A promotion was run on WCC preferred trusted trader scheme called “No Rogue Traders Here”. To obtain the name of a vetted contractor householders should telephone 0800 233 5000. 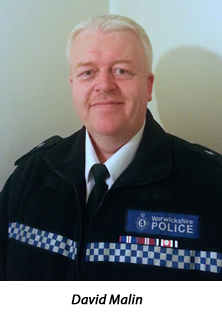 The Police introduced a new policing model in July and the Alcester North safer neighbourhood policing team comprises five officers, a sergeant, a constable and three PCSOs. Crime, particularly burglaries, has increased last year but seems to be reducing following a series of arrests for burglaries. For 2019/2020 the Police will be recruiting 100 new officers. Five officers will be allocated to a new rural crime investigation unit. WCC is offering confidential support to people who care for others at home. One in ten people in Warwickshire ia a carer and help and advice with issues is available by calling 024 7610 1040 – option 4. County Councillor discretionary community grants fund and grants were awarded to Henley Library, Langley Village Hall, Tanworth PC for replacement fencing in Malthouse Lane, Henley in Arden Arts4All week, a replacement of a notice board in Claverdon, the Parenting Project for activities at Henley in Arden Hub, Stratford District Time Bank, VASA and “Lifespace” to train mentors. Arden Division Chairs and Clerks meeting allocated funds from my County Councillor’s small road safety schemes budget for the exit from the Claverdon Surgery on to the A4189, traffic calming in Ullenhall, a Clearway along the Causeway in Earlswood, improved signage on Foreshaw Heath Lane and the Common and dropped curbs in Prince Harry Road, Henley in Arden. On February 7 the full Council confirmed the Conservative budget proposals. General Council tax will increase by 3% and there will be an additional 2% for the Adult Social Care levy. The Council also accepted that some £30-£40 million savings will be needed over the next four years. If all these savings are achieved social care, both adult and children’s, will account for about 65% of the Council budget. The Police have raised their precept by 10.5%, or £24 per year for a band D property. On the positive side the Council has allocated £500,000 County wide to support community transport services in a move to support isolated communities and individuals. A further £12.5 million capital is to be borrowed to fund road safety schemes, waste recycling compactors at the household waste recycling sites and improved cycle routes. Henley-in-Arden based Bright & Beautiful is celebrating its recent accolade of being named ‘Business Transformation of the Year 2019’ by Neighbourly, the world’s largest franchisor of home service brands focused on repairing, maintaining and enhancing homes and properties. Business owner, Delpreet Shergill, was presented the award at Neighbourly’s European annual Reunion held in Manchester at the end of March in recognition of delivering extremely high levels of client service, performance improvements and taking some brave decisions to drive efficiencies and grow her business significantly in 2018. Trading since May 2017, Delpreet’s hard work has definitely paid off and now she has eight professional housekeepers working for the business delivering eco-friendly cleaning, tidying, laundry and ironing services to the highest of standards of security and service in and around Henley-in-Arden. Delpreet Shergill of Bright & Beautiful Henley-In-Arden, added: “I am overwhelmed to win this award, particularly when you know the other 60 franchisees you are up against in the network. It is a huge endorsement for me both personally and professionally, particularly as we had many challenging times when we launched the business just under two years ago. We have since grown and expanded the business exponentially and seen a 185% growth in our clients – we also have plans to open a drop-in laundry and ironing shop later this year . I am extremely proud to have built a business that has created so many roles for local people and to be delivering a premium service at the heart of the community. Based in Henley-in-Arden, Bright & Beautiful covers the West Midlands, including Henley-in-Arden, Hollywood, Wythall, Tanworth in Arden, Dorridge, Knowle, Barnt Green, Alvechurch, Studley, Redditch and surrounding areas. It is part of a national network of 60+ franchisees building their own local business, creating 600+ jobs and delivering more than 120,000 home cleans per year. For further information about Bright & Beautiful and the services it can offer, visit www.brightandbeautifulhome.com/henley-in-arden or call 01564 339967. 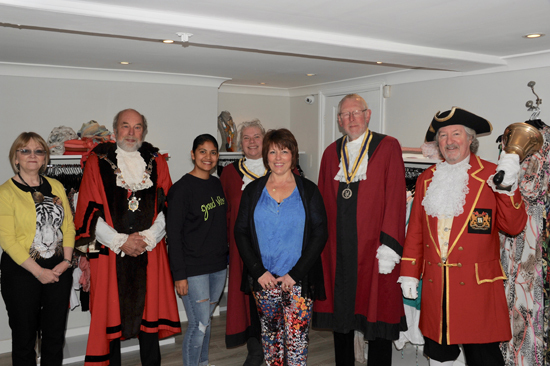 On Wednesday 10th April the High Bailiff Graham Smith, the Town Cryer and officers of the Court Leet of Henley in Arden visited the new ladies outfitter to attend the official opening of COCO IVY - LIFE STYLE. The owner of the company, Evonne Sargent, who has previously had fashion shops in London, confirmed this is the second of their stores in the midlands. Their first shop is at Stratford garden centre which opened five years ago and has been a tremendous success. The shop manager, Julie Trinder, and her assistant Sally Roden will be looking after the Henley shop on a day to day basis. They have a vast selection of affordable clothing in many different sizes and colours. Their moto is: "FASHION IS A TREND, STYLE IS INDIVDUAL"
Please call in and have a look around, we all wish them every success in their new venture. 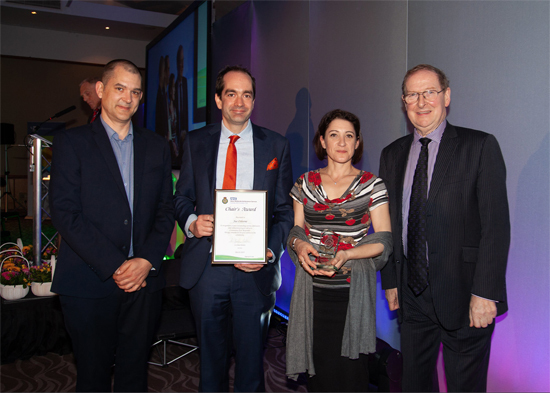 Our photo shows Sue's three children with Sir Graham Meldrum, Chairman of West Midlands Ambulance Service. The numbers were drawn by Annette Dukes at Dukes Stationers. Many thanks to all our members who contribute by participating in our 100 Club and please do get in touch if you would like to join. We may all be utterly exhausted by the unalloyed, unbelievable, unprecedented, unprofessional and appalling madness we have all seen and heard in Parliament recently. Euro-Meddling, however, is by no means a recent phenomenon as this fictional account of the last hours in the lives of Mr & Mrs Hitler reveals. 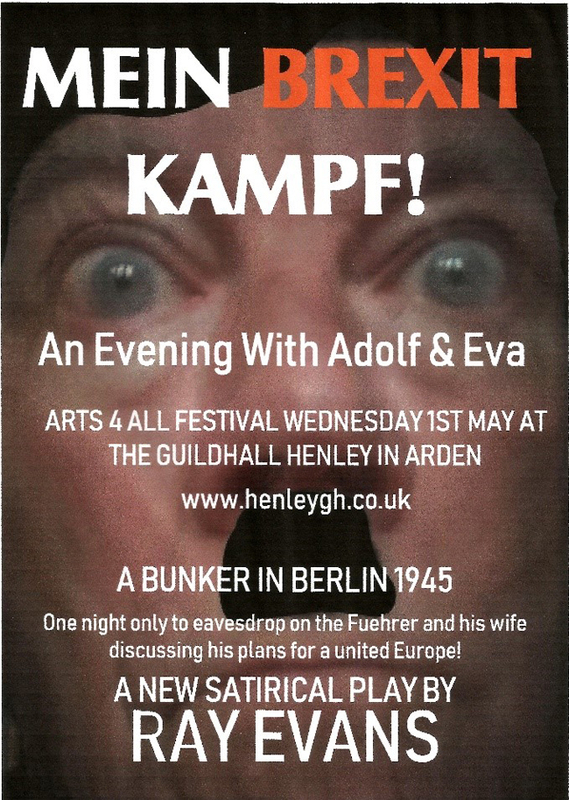 Written and performed by Ray Evans and company, this thoughtful presentation gives witness to Eva’s futile efforts to make him admit to her, before his life closes, that his plans for a single European state were hideously flawed. The plot, centred on the Fuhrer’s obsession for Lebensraum [living space] is littered with shocking factual statements by opposing WW2 high-ranking contemporaries which only goes to prove that we constantly live in danger of Armageddon if we invest too much trust in our politicians! Actors will read from a reimagined transcript, the narrative unwinds just hours before their demise in a bunker somewhere in Berlin in April 1945. 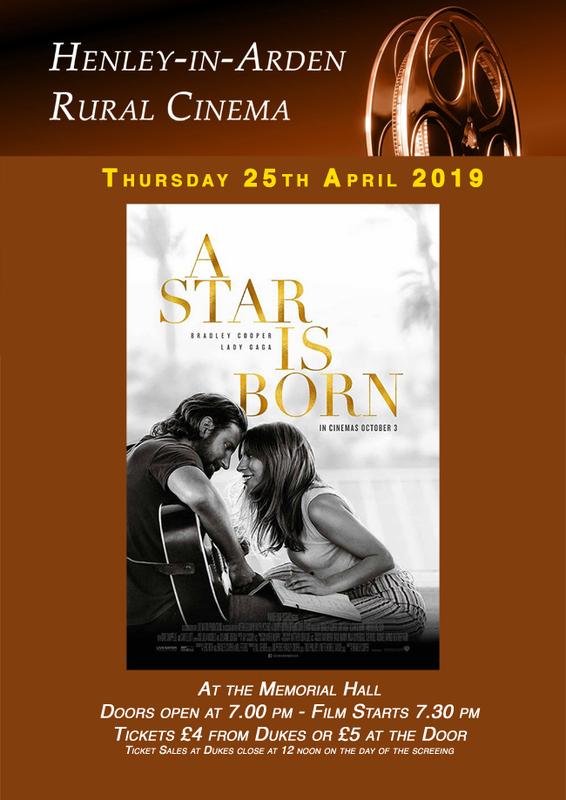 One performance only, Wednesday 1st May 8.00 P.M. (Running time 1 hour with 15 minute interval) by invitation from the Guild Hall Trust, a part of the presentation of ARTS4ALL this year. Any similarities between the narrative contained in this reading and the factual events still unfolding in Westminster are purely coincidental. 'When I Fall If I Fall' and 'See Primark & Die' in place of 'Testament of Yootha'. Plus extra event on Sunday April 28th in the Guild Hall at 7.30 p.m.
the Mikado or The Town of Tittipu. From left to right is John James, Speaker secretary, Nick McKenzie, Chairman & Pablo Mason. 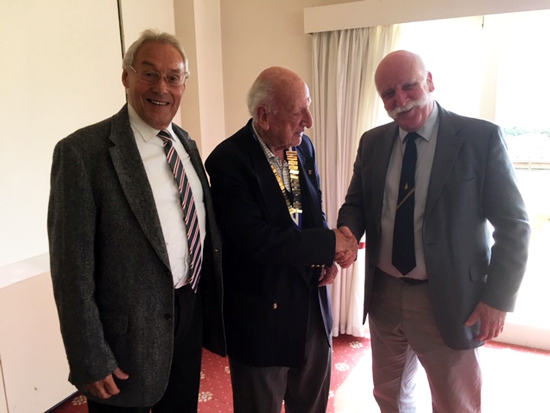 The Probus Club of Beaudesert, meeting at Henley Golf Club on 3rd April, was privileged to have Captain Pablo Mason as its guest speaker. Forty- five members heard Pablo speak for nearly an hour without notes about his experiences flying Tornadoes in the first Gulf War in 1991. He was open and frank about the job they had to do in the region and came across as both charismatic and sensitive, particularly to the team who worked with him whilst "on tour". He left the RAF at the end of 1991 and wrote two books on his experiences - " Pablo's War " and " Pablo's Travels ". He became a civilian airline pilot in 1994 when he joined Thomas Cook - a number of Probus members recall Pablo walking down the gangway from the cockpit to meet passengers - it wouldn't happen today! He retired from flying in 2007 and now lives in Claverdon, where he still maintains an active interest in aviation. Probus is a club for professional and business people who are fully, partially retired or nearing retirement, who wish to maintain a social network with others who have similar interests. Aston Cantlow and District Society celebrated its 25th year milestone with a weekend of activities. 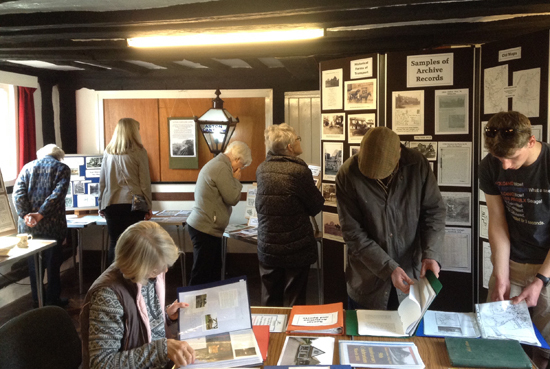 Displays from its extensive Parish archive were on view in the Medieval Guild room in Aston Cantlow Village Hall over the weekend 13/14th April. 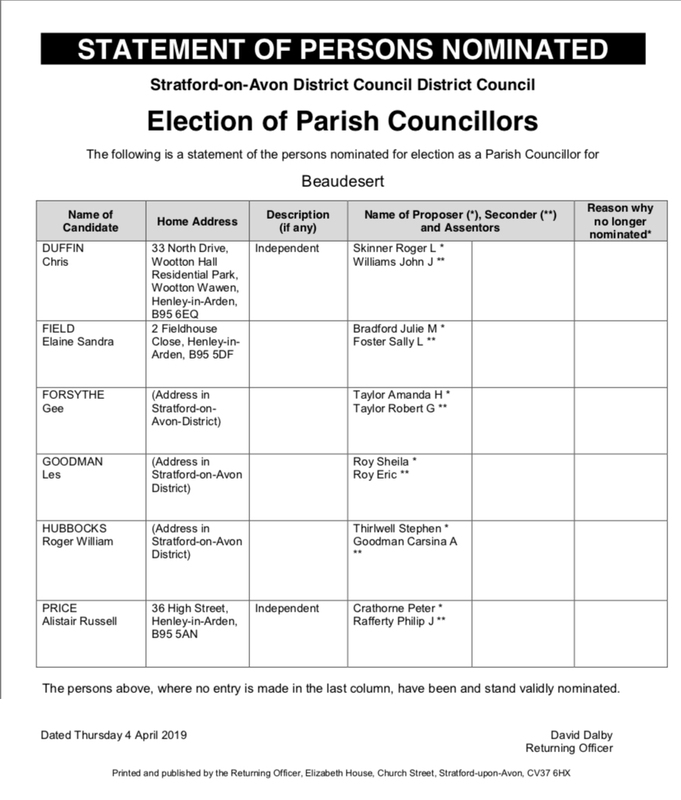 Twelve display panels covering the whole of the Parish including the villages of Wilmcote in the north, Aston Cantlow and the hamlets Newnham, Little Alne. Billesley and Shelfield stretching as far north as Wootton Wawen. It was extremely well attended with a continual flow of visitors on both days. There were cries of glee when forgotten happy memories were rekindled amongst the many albums, scrap books and photos on display. 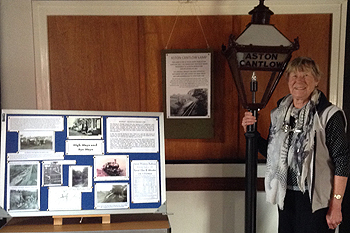 One of the latest additions of memorabilia items from the Parish, and the focus of a display on transport from the industrial revolution, is one of the old Aston Cantlow halt oil lamps from the abandoned branch line to Alcester. It was purchased jointly by the village hall and the local history society and carefully restored, and now in use as a lamp – electric not oil! The creator of the exhibition Margaret Twigg, pictured right, said she was delighted with the amount of visitors who visited to the exhibition and was pleased to receive some new items which were brought in to add to the archives. On Saturday evening a lavish supper was served in the main hall and enjoyed by members of the society, village hall trustees and friends. This was followed by an illustrated talk about the old Wilmcote signal box by Martin Quatremain and Paul Tilly who restored the lamp gave a presentation on the history of the lamp and local railways. The Society was delighted to welcome Gillian White to give us a fascinating talk about what every child must have had, the iconic Teddy Bear. The teddy bear is a fairly modern toy having been around only since the early part of the 20th century. They were apparently developed simultaneously by toymakers Morris Michtom in the U.S. and Richard Steiff in Germany. 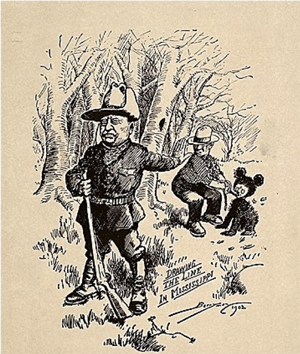 The name ‘teddy bear’ comes from former U.S. President Theodore Roosevelt, who was commonly known as ‘Teddy’, and originated from an incident on a bear hunting trip to which Roosevelt had been invited. Most of the other hunters had already killed an animal so a bear was caught, tied to a tree and Roosevelt invited to shoot it. He refused to shoot the bear, deeming this unsportsmanlike, and it became the topic of a famous political cartoon. Morris Michtom saw the drawing of Roosevelt and was inspired to create a teddy bear which he put in a shop window with a sign ‘Teddy's bear’, the toys becoming an immediate success. At the same time in Germany, the Steiff firm, unaware of Michtom's bear, produced a stuffed bear from Richard Steiff's designs and exhibited it at the Leipzig Toy Fair in 1903. An order for 3,000 was placed by a New York buyer and within a few years output had soared. The Steiff company had originally been founded in 1880 by Richard’s aunt Margarete Steiff, a seamstress. The Steiff factory closed during World War I and this inspired several British companies to start production of Teddies, including Chad Valley. Now, though, only one traditional teddy bear company remains, Merrythought, which was established in 1930. While early teddy bears were covered in tawny mohair fur, modern teddy bears are manufactured in a wide variety of commercially available fabrics, most commonly synthetic fur and many are now washable. Over the decades, teddy bears have inspired a plethora of characters. One of the earliest was Rupert Bear who first appeared in the Daily Express in 1920. The mantle of Rupert’s artist and storyteller was taken over by Alfred Bestall in 1935 and continued by him for the next 30 years. The comic strip is still published daily with many of these stories later being printed in books, and every year since 1936 a Rupert annual has also been released, (interestingly, these annuals appeal more to adults). Subsequently Winnie the Pooh appeared in 1924 created by A.A. Milne as a tale for his son Christopher. Winnie was apparently named after a Canadian black bear that Milne frequently saw in London Zoo. 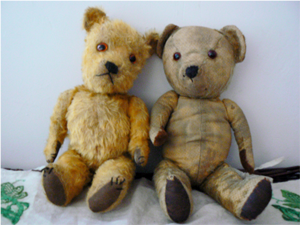 The popularity of the toy had also inspired the melody ‘The Teddy Bears' Picnic’ in 1907, with the lyrics added in 1932. Sooty, Paddington, and Pudsey Bear all became popular creations in the 1950s but eventually the cult of the Teddy waned only to be given a restorative boost in the 1980s by the TV series ‘Brideshead Revisited’ and its character Sebastian Flyte with his teddy Aloysius. Gillian concluded her talk by reading some lines by John Betjeman and revealing his constant companion Archibald Ormsby-Gore, better known as Archie, his teddy-bear. The Society will now be having a break from its talks until it reconvenes on 19th September with a talk about the Great fire of Warwick. 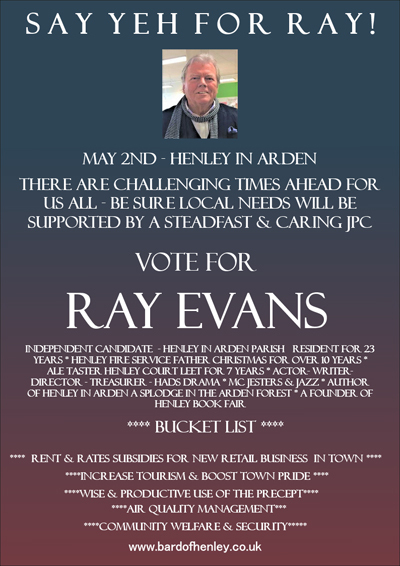 This website is sponsored by the Henley War Memorial Trust. The tennis season is officially underway at Henley and the ‘Season Opener’ Tournament took place on Thursday 11th April. With a chocolate theme, as there was certainly plenty around, lots of players joined in including league players and experienced social players. It was also a great opportunity for new members to mix in, taking part in their first club tournament. Everyone enjoyed themselves with some great matches all played in a great team spirt. 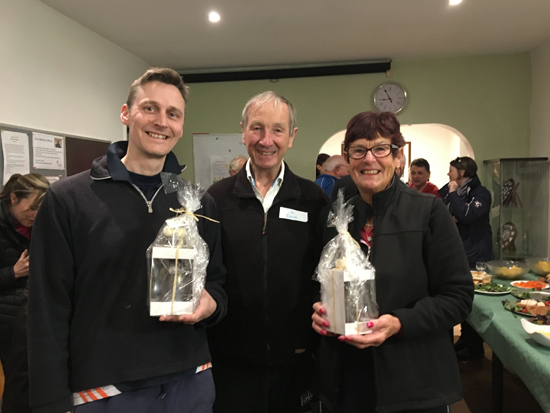 The winners of the most games during the evening were Mick Howard and Liz Fox who were delighted with their Easter Eggs and chocolates, all supplied by Henley Chocolates. 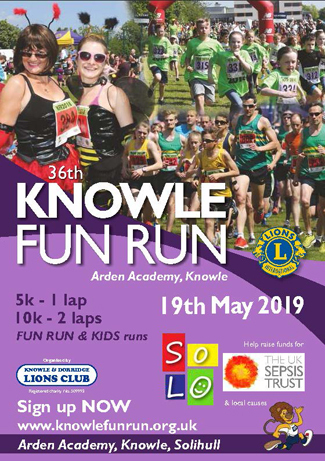 Dave Broadbent, a club member and Henley War Memorial Trust representative, presented the prizes as the event was helping fundraising for the proposed Arden Recreational Centre - the ARC - at the sports ground. It was also a special night for friends of the late Maureen Parkes. Maureen was a member of the club for over 50 years and had a great group of friends who always enjoyed playing together in leagues as well as social events. 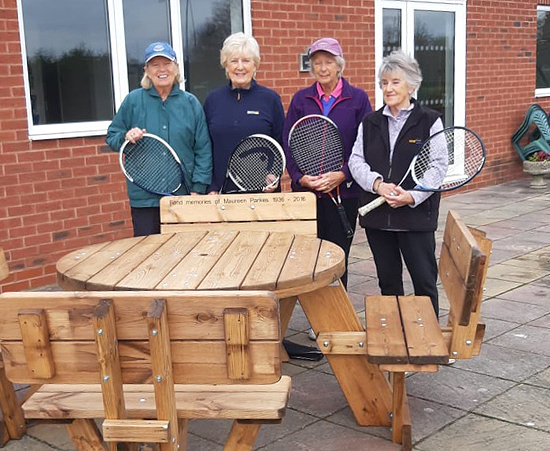 Annette Walker led the tribute to Maureen who left a kind bequest in her will and a new outdoor table with seating has been purchased, with an inscription in memory of Maureen. It was a fabulous evening, with lots of fun, merriment and happy memories, a great start to the tennis season. If you would like more details about the club please email henleyinardentennis@gmail.com. The club caters for all ages from under 5s upwards. 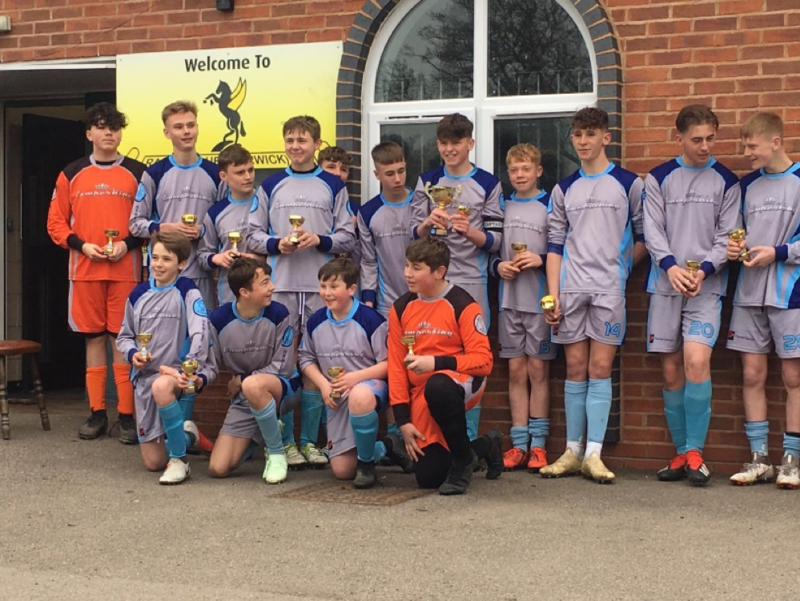 On Sunday the 7th April Henley Forest FC under 15s played Hillmorton under 15s at Racing Club Warwick’s ground in the Mid Warwickshire League Cup Final. Henley controlled the game up until the final 10 minutes, playing really good football and moving into a 3-0 lead which could have been more but for a disallowed goal and a saved penalty. The last 10 minutes proved to be a really tense affair with Hillmorton pulling back 2 goals to make the score 3-2 going into the last couple of minutes, but Henley held on to win. Congratulations to all the lads on what was a well-deserved victory! 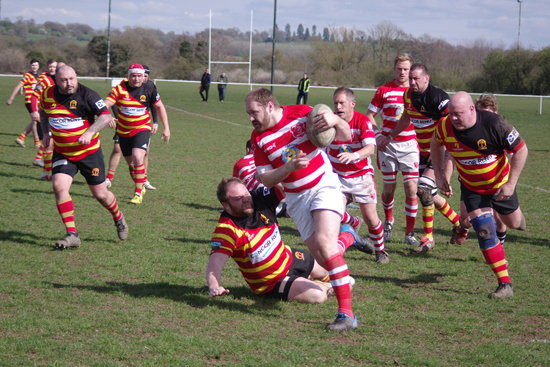 Saturday saw a perfect day for running rugby, a mild breeze and the sun beaming down on a dry flat pitch. Kings Norton sent the restart deep into the Claverdon 22, pilling on the pressure. Following some disagreements on the floor Alex Haynes and a KN player both saw yellow. KN pumped the ball into the corner, of the line out they set up the maul and moved forward. Claverdon managed to deal with the maul forcing KN to spread the ball wide. 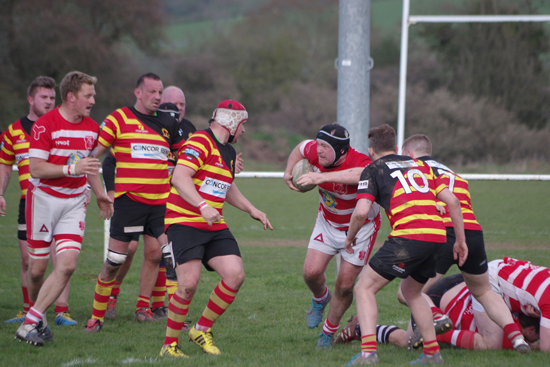 Good defence in the middle from Colin Marklew and Tom Hudson forced the knock on, scrum Claverdon. After soaking up the pressure Claverdon were able to clear their lines. With the wind beginning to pick up Williams pinned KN back by kicking into the corners. 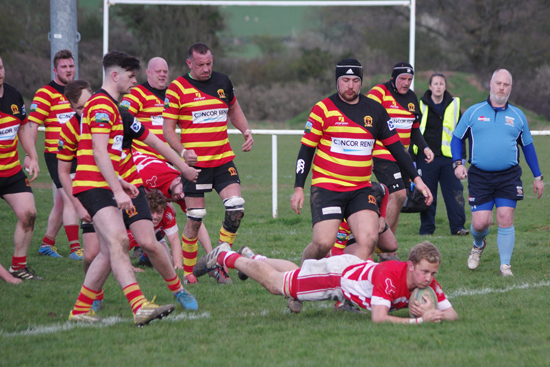 A clean line out take from KN was soon disrupted by the Claverdon defence, after turning the ball over Claverdon worked the ball tight through the hands and it was Steve Grimsley who took the final offload to dot down in the corner 0-17. The half time huddle was buzzing but Barton’s words were to not get complacent and to turn it up another gear. Anyone can now sign up to the email alert system automatically and instantly, in the same way residents use other email alerts such as roadwork warnings etc. 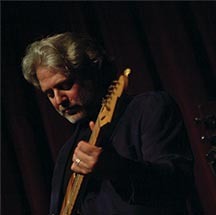 a WCC standard. 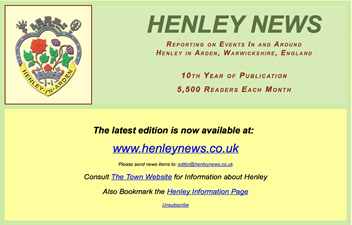 Henley NEWS offers email alerts to advise readers, who have registered for the service, when a new edition is published. 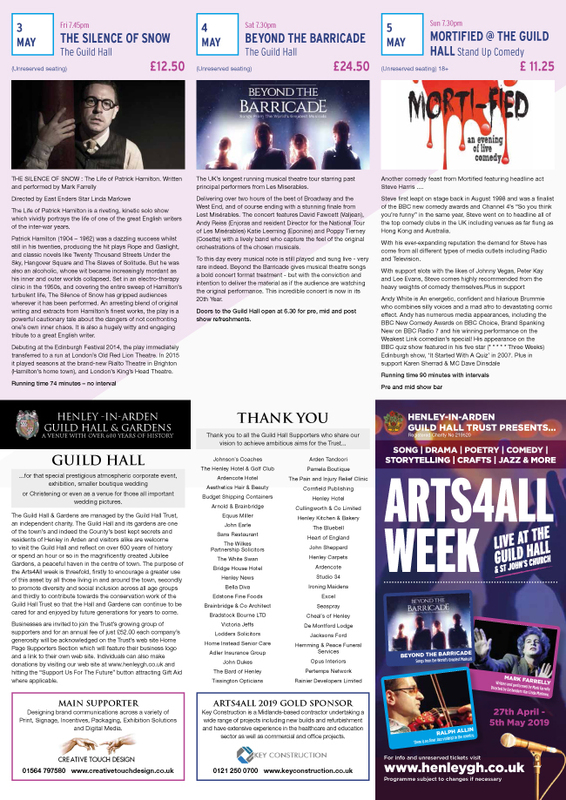 Adverts should be 350 x 150 pixels with a web link or A4 page and sent to adverts@henleynews.co. DATE FOR YOUR DIARY June 22nd Church Fete. Tuesday 23rd April 7.45pm in the Baptist Church hall. Carol Smith Choosing the Right Plants for a Shady Border. 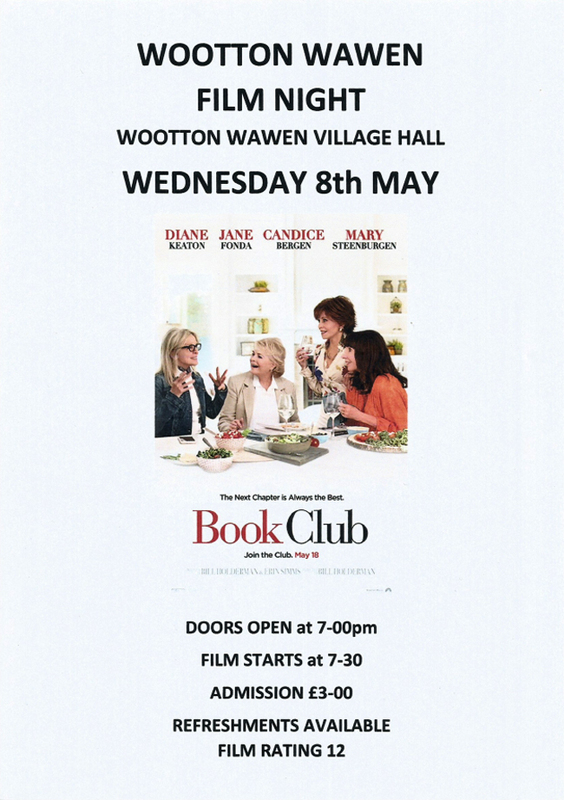 Friday 17th May 7.00pm in the church hall, Beaudesert Lane. Teams of 4 tickets cost £8.00 each to include fish and chip supper. Bring your own glasses and drinks. LLOYDS MOBILE BANK is on the Medical Centre car park at the following times. Have you ever thought of having an allotment? We have over 40 plots by the station. It’s a smashing pastime to grow your own veggies and keep fit as well. We have wonderful camaraderie up there. If you feel interested and would like a look contact Nick Haycock on 07719 345115. Why not join Henley Neighbourhood Watch by going to www.ourwatch.org.uk and entering your postcode Information about crime in the area direct to your computer/tablet? Also available by joining the Warwickshire Police Community Messaging Service (CMS) Go to www.warwickshire.police.uk/cms and follow instructions. CLASSIC X-R-CISE CLASS. Monday mornings (parish hall). 10.30-11.30am. Working on mobility, balance, coordination, etc, for maximum body health. £15.00 per session. (Introductory 1st session £10.00). For more info. 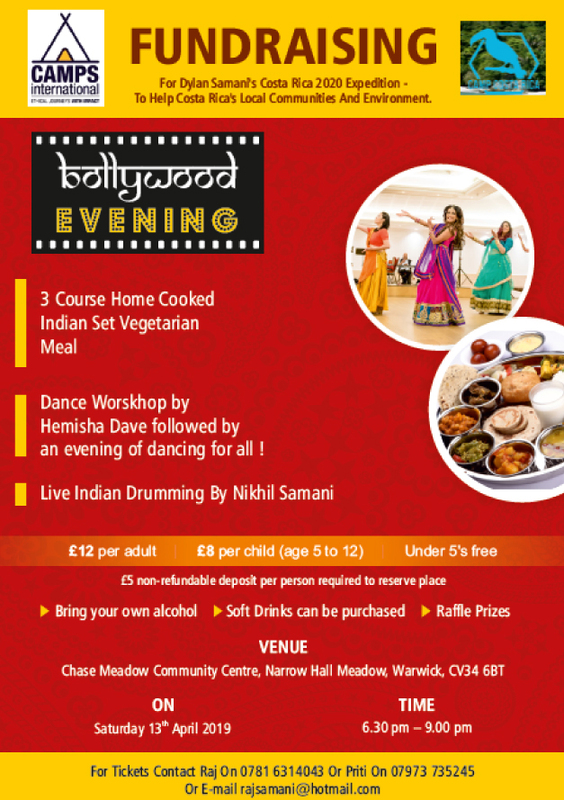 please call Paul on 07906337623 for more information or to book your place. LITTLE ACORNS NURSERY 'Stay & Play' Interested in finding out more about our nursery? 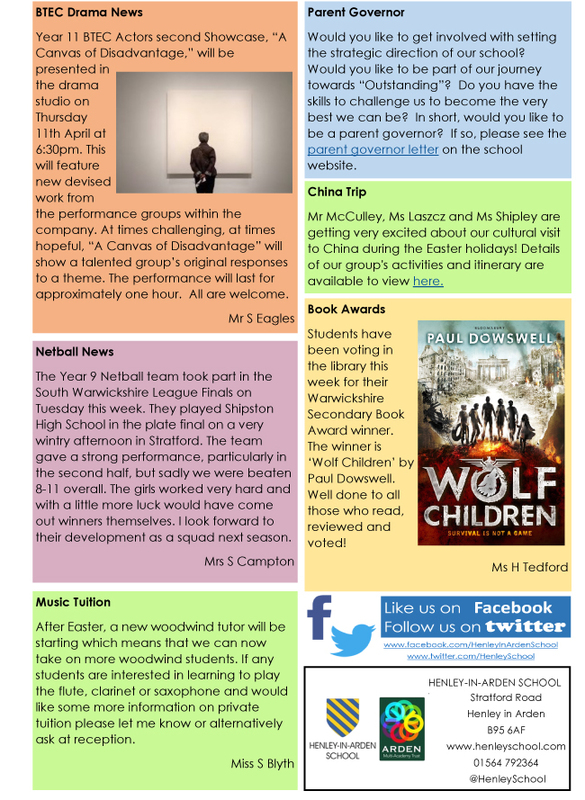 Please come along with your child 9.15 – 10.00 on Wed 24th May and 12th July. Contact School Office on 792766. YOGA AT ULLENHALL VILLAGE HALL Hatha Yoga & Relaxation Tuesdays 1.30-3.00pm suitable for experienced & beginners. Contact Gill Russel 07973575597, gilrus3@btinternet.com, www.yogill.com. £7.00 per class. Contact Alex Brown Tel: 07966516914 . Email: yogawithalexbrown@gmail.com. JOLLYTOTS meet Tuesdays and Thursdays in the Church Hall, Beaudesert Lane during term time. Lots of activities, toys, games, arts and craft for under 4s. For more information please contact Keith on 793925. HIRE THE GUILD HALL and GARDENS Perfect for special occasions, boutique weddings, Christening parties, private dining, funeral wakes. Visit WWW.HENLEYGH.CO.UK for more information and hire charges. 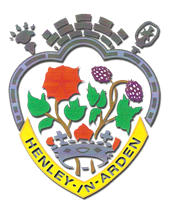 We are hoping to hold a HENLEY’S HIDDEN GARDENS on June 16th 2019. The Court Leet and Court Baron dates from a Royal Charter and was a Court authorised to deal with matters relating to the duties and services owed by the peasants or villains (not Freemen) to the Lord of the Manor. It exercised the peacekeeping jurisdiction of the Sheriff’s twice yearly tour of the hundred courts. It received presentments about obstructions of the highway and watercourses. It regulated the weights and measures. HENLEY IN BLOOM Henley in Bloom is the organisation behind making Henley an even more attractive town by a colourful display of flowers in the High Street and elsewhere in the town. There are over 100 planters and flower beds which are filled with blooms every year and all members of the community are encouraged to help not only with the initial planting but, even more important, the ongoing maintenance and watering. 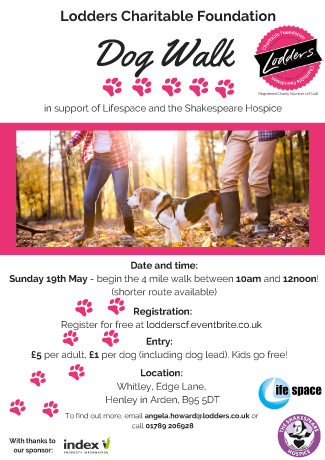 Anyone interested in helping this organisation please contact Sheila Davis on 07779 157580. The Society meets every third Third Thursday - September to April. In the summer, there are normally two visits to historical sites. Visitors and new members are very welcome. Rotary International in Great Britain and Ireland, is an organisation of more than 55,000 men and women who, as members of over 1,850 Rotary clubs, volunteer their time, talents, professional skills and energy to improving the lives of people in their local communities and others around the world. 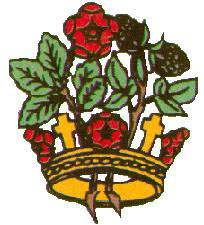 The Henley-in-Arden Club meets at the Golf Club on Tuesdays at 12.30 pm for 1 pm. New members are always welcome. Secretary of Henley Rotary Club - Mike Redman 01564 793491. We play at the Memorial Hall, Station Road, Henley-in-Arden every Friday and Sunday evening from 8pm-10pm. The season runs from mid September to end April. We are looking for new members to join our friendly club playing good social badminton. If you would like to visit and play, just turn up (visitors fee £4). Free car park. Or contact us for further details 01564 793320.
Henley Cricket Club fields two teams in the Cotswold Hills League on a Saturday and two teams in friendly fixtures on Sundays from mid-April to mid-September. We are always on the lookout for new players, irrespective of age or ability. Anyone interested in joining our club should contact Andy Thompson. Taekwon-Do is a Korean martial art that combines fitness, self-defence and control. Henley TKD is a small, friendly and vibrant club catering for all ages (from 5 and up) and abilities. We train on Tuesdays 6:30-8pm at the Memorial Hall on Station Road. Beginners and the curious are always welcome – first lesson is free for all newcomers. For more information contact Alan Batson on 07543 649 713. Jollytots meet every Tuesday morning 9:30-11:30 and a Thursday afternoon 1-3 in the Church Hall on Beaudesert Lane, Henley. It is open for all under 4 year olds and costs only £1.50 which includes a drink and a biscuit. There are toys, games, arts and crafts and singing. It is run by Keith and Lulu. Any questions please ring Keith on 01564 793925 or 07855 920463. Thursdays, 11.15am at the Parish Hall, Beaudesert Lane. Age, health or fitness no barrier. £6 per session – no termly fees. 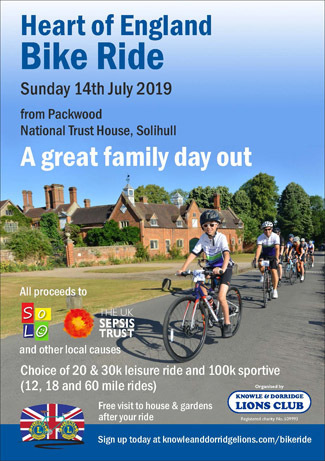 For further information contact Debbie Wild on 07773 318830. Meets the last Sunday of the month at Wootton Wawen except December at village hall at 2pm for a conducted walk of about 5 miles over the local and surrounding area footpaths. The Group welcomes all walkers. There is no subscription. More details from Keith Thomas 01564 794806. De Montfort Lodge is the only freemasons’ lodge meeting in Henley. It was established in the town in 1930 and holds meetings in the Guild Hall. Anyone interested in freemasonry should contact John Pollard on 0121 247 6140 or 07952 780096 or email johnpollard1966@virginmedia.com for further details. Love Life, Love Friends, Love Food then you’ll love Slimming World. A warm and friendly welcome awaits you at Henley Slimming World. The group is held every Wednesday at 6:30pm at Henley High School, Stratford Road B95 6AF. Please call Sarah Jones for more details on 07922 670959. ALZHEIMER'S SOCIETY IN HENLEY If you have dementia, or are caring for someone with dementia, Alzheimer's Society welcomes you to join us at our Dementia Cafe in Shipston-on-Stour at Stour Court, Old Road, Shipston-on-Stour, CV364HF on 1st Friday of the month from 2 - 3.30pm, Dementia Cafe in Stratford at St Andrew's Church Hall, Church Lane, Shottery, CV379HQ on 3rd Tuesday of the month from 10.30am - 12.30pm, Day Care which runs weekly in Henley in Arden (charges apply for this service). For more information contact the Warwickshire Office on 01926 888 899 or email southwarks@alzheimers.org.uk. Plays Duplicate Bridge of intermediate standard on Tuesday evenings at The Wootton Wawen Social Club, commencing at 7.00pm and usually finds time for a tipple, which may or may not improve our play!! Play commences at 7pm promptly. There are normally 5 - 8 tables and the club does not issue master points. For further information please contact the Secretary - Christine Whitehouse on 01564 792993 or the Treasurer on 0777 887 1930. 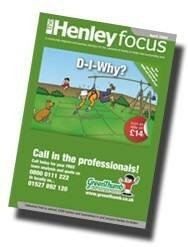 Each month the Henley Focus contains plenty for everyone with local business advertisements, reviews and community information. 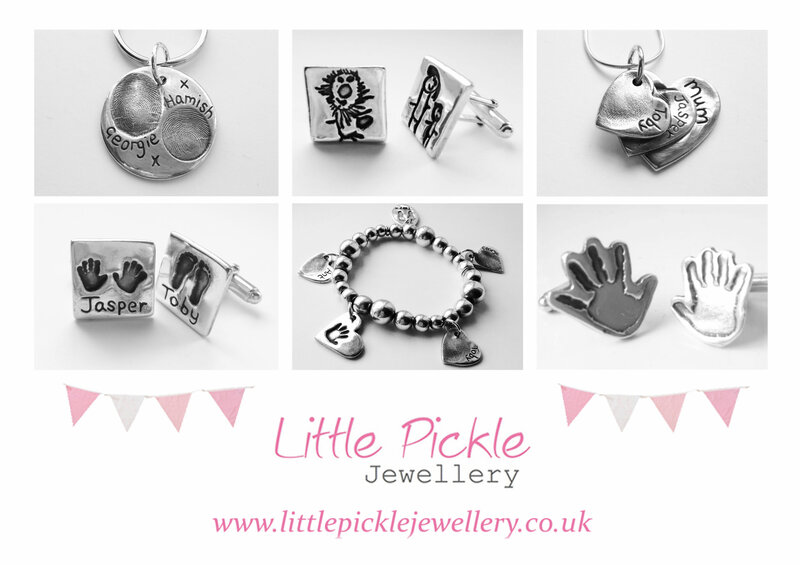 The Henley Focus could be helping you to promote your business or service to local people at affordable prices and also offers a range of design services at very reasonable rates. 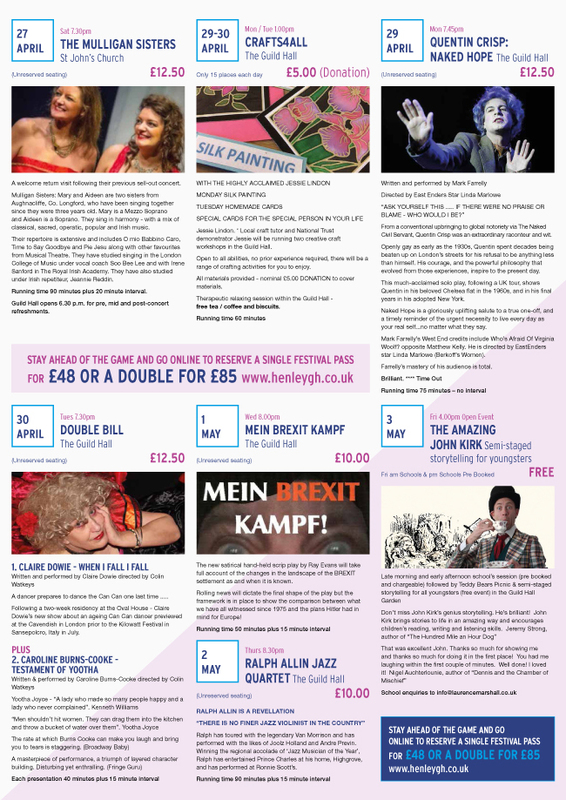 The publication is very happy to promote community and charity events free of charge. 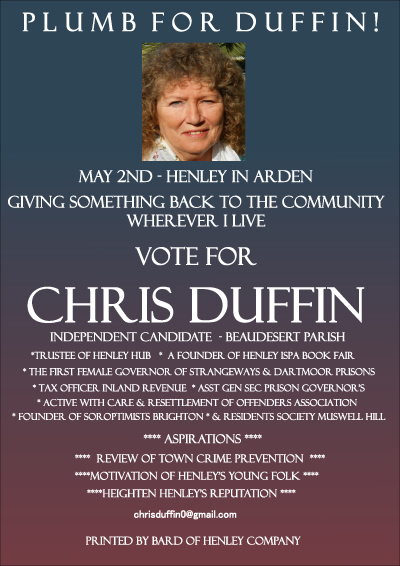 Please call Karen on 01564 774748 or email karen@henleyfocus.co.uk more information. Meetings are held on the first Wednesday of the month in the Baptist Church Hall, at 2.15pm. The Club has around 80 members and organises a varied programme together with various outings. 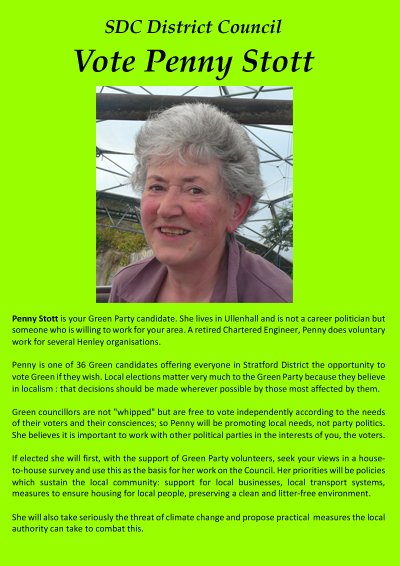 If you are interested in joining please contact Gordon Trinder. 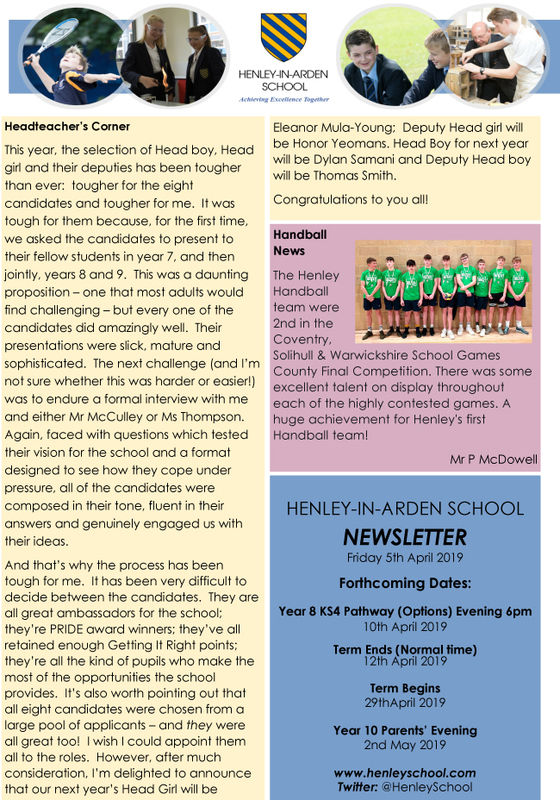 HENLEY NEWS is a 'Not For Profit' online newsletter. 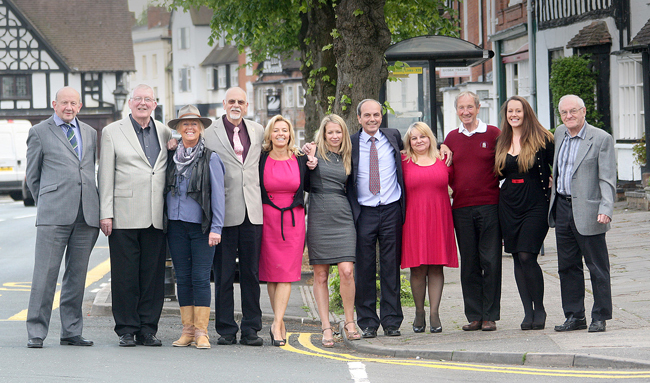 Advertisers are asked to make a donation to the Henley War Memorial Trust. Personal Abuse. Criticising an argument is fine, attacking the person making it is not. In other words, you can say a person’s argument is idiotic but don’t call them an idiot. Expletives and other inappropriate content. Legal. Libellous comments, that is those that make defamatory claims about people, will be removed. Racist, sexist and homophobic material. Comments likely to incite religious hatred. This should be self-explanatory. Generalisations about entire groups of people are never sensible and, in some cases, may be illegal. Letters to the Editor. All letters for publication must include the name and full address of the writer. The writer's name and parish will be included at the foot of the article.